You may have noticed recently that a classy, small bakery is slowly making headways into the already saturated baking goods market, long dominated by established local company Breadtalk. Duke Bakery claims on their website that they use only “the finest quality ingredients from Europe”, but utilises a combination of “Japanese, European and Taiwanese styles of bread making to create an impressive line up of artisan breads”. In short, Duke Bakery originated from Taiwan and is gaining popularity here. The first outlet in Singapore opened its doors on 27 October 2013 to “rousing response”, and it recently opened its newest store at International Plaza in late November 2015. 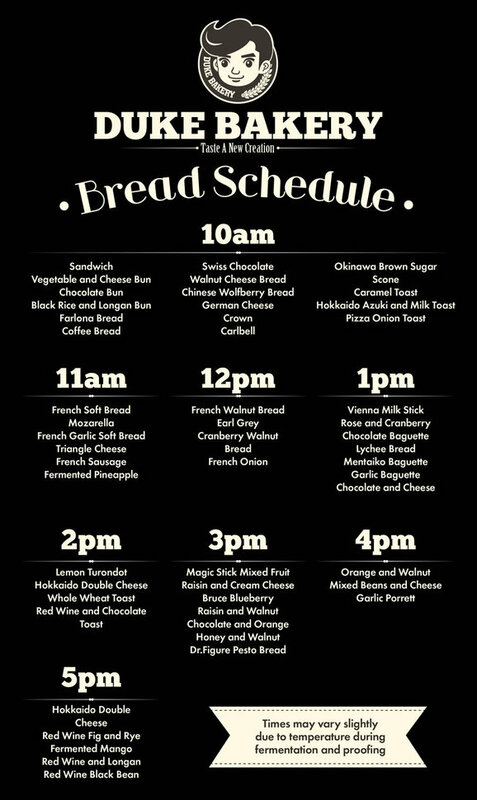 Here is a list of the assortment of breads that they sell at their stores, taken from their Facebook Page and credits to both Duke Bakery and SpringTomorrow.com. This certainly gives Singaporeans a plethora of choices when it comes to choices of a quick breakfast or snacks. Duke Bakery is also constantly innovating within the competitive market with new flavours introduced occasionally where they usually announce via their Facebook page. What surprises us, which we learnt from the SpringTomorrow review, was how their variety of breads are sold at different timings due to “fermentation and proofing” issues, and their breads are probably delivered to their stores from a central location. Unlike Breadtalk which makes their breads on-site, Duke Bakery stores do not have an adjacent kitchen. Their breads are more expensive than what other bakeries are offering - certainly in the premium range. Duke Bakery employs such a strategy and realised that locals were initially unreceptive to their products, which resorted to them offering free samples for potential customers to buy. Of course, we have seen countless people walk in for the free samples, but they have been effective, especially when a horseshoe-shaped chocolate-flavoured bread cost slightly more than $7, with the average price around $4-5 by our estimates. There also have been an inconsistency of service standards as can be seen in reviews left by users on HungryGoWhere. If there is one thing that we absolutely adored despite the above minor flaws, it is how they list every ingredient in their breads, a boon for not only the health-conscious but also the ones who have food allergies or preferences. Some breads do have eggs and nuts (Walnuts seem to be a popular ingredient in their breads), so do watch out for those if you’re allergic to them! The Bakerro Team only knows one other bakery (Providence) which informs customers of the ingredients present in their bread. Other bakeries, such as BreadTalk, should seriously consider implementing this, especially with the trends of consumers being more health-conscious and starting to seriously look at what they’re consuming. If you do have a bakery, cafe or restaurant that also has a system of declaring their food ingredients, do let us know in the forum page under the Eggless // Gluten-free Baking section. A Duke Bakery Privilege membership card rewards you with a 10% discount every time you purchase your favourite breads. We hope this will allow you to choose and savour your breads with more ease and leisure. With our Duke Bakery Privilege membership card, you can enjoy the tastes of our new creation and experience new foodscapes every day. Our lifetime membership card will be given away during special promotions, events, outlet openings and Facebook giveaways (terms and conditions apply). Like Duke Bakery on Facebook to receive the latest updates and promotions. The Duke Bakery membership card entitles you to enjoy a 10% discount on all full price products. The Duke Bakery membership card is valid for use in all Duke Bakery outlets in Singapore. The 10% discount may not be used in conjunction with any other Duke Bakery promotions. The Duke Membership card must be presented at time of purchase. Duke Bakery reserves the right to amend the terms and conditions without prior notice. However, from a recent Facebook post, the membership card is now available for $20 lifetime membership and be rewarded with a $10 voucher! The folks at Startup Storey decided to contribute an article to share their knowledge on what makes a startup tick. Great piece of content if you’re thinking of starting your own business. With the speed at which technology evolves, running a startup often feels like a race. A race to being the first, becoming the best, and growing to be the one with the most market share (whatever it is you want to achieve). As part of our baking recipes series, we have decided to include some easy bread recipes that any aspiring baker can try out at home. As an aspiring baker, pastry is a delicate topic. We have listed below 5 classic pastry recipes to try out. Note that a small amount of baking powder will make pastry lighter, more tender and more digestible. All times are GMT8. This page was generated at 08:35 PM.